How are emotions experienced in the body? Researchers at Aalto University say they know. Emotions help adjust our mental and also bodily states to cope with the challenges we face and the sensations arising from those bodily changes are an important feature of our emotional experiences. Anxiety may be experienced as pain in the chest, whereas falling in love may trigger warm, pleasurable sensations all over the body. 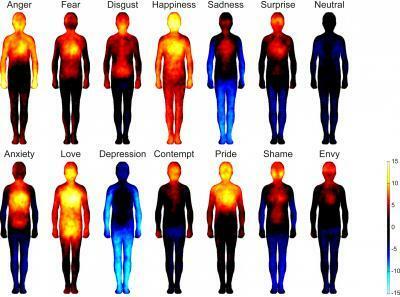 The new analysis says it maps how emotions are literally experienced through the body. Some skepticism is warranted. The work was carried out online and over 700 individuals from Finland, Sweden and Taiwan took part in the study. The researchers induced different emotional states in the Finnish and Taiwanese participants and then the participants were shown pictures of human bodies on a computer and asked to color the bodily regions whose activity they felt increasing or decreasing. Methodology concerns duly noted, the researchers found that the most common emotions trigger strong bodily sensations, and the bodily maps of these sensations were topographically different for different emotions. The sensation patterns were consistent across different West European and East Asian cultures, highlighting for the authors that emotions and their corresponding bodily sensation patterns have a biological basis. Different emotions are associated with discernible patterns of bodily sensations.Credit: Aalto University and Turku PET Centre. Emotions adjust not only our mental, but also our bodily states. They say this helps prepare us to react swiftly to both dangers and opportunities such as pleasurable social interactions present in the environment. Awareness of the corresponding bodily changes may subsequently trigger the conscious emotional sensations, such as feeling of happiness, says assistant professor Lauri Nummenmaa from Aalto University.